Sergio Munoz at Media Matters details the recent -- and, frankly, absurd -- attacks being leveled against Judge Richard Posner by such outlets as National Review Online and long-time discredited GOP "voter fraud" fraudsters like Hans von Spakovsky. Also, Justice John Paul Stevens, who wrote the U.S. Supreme Court's controlling decision in Crawford affirming Posner's lower court ruling, offered noteworthy comments as well recently, when he was asked about Posner's admission. Justice Stevens now offers a similar admission about his own SCOTUS ruling in the case. According to a Wall Street Journal interview, Stevens now says "he isn't "a fan of voter ID' and wasn't in 2008.'" "My opinion should not be taken as authority that voter-ID laws are always OK," Justice Stevens said. "The decision in the case is state-specific and record-specific." Contrast Stevens' remarks about his own decision in Crawford, with the duplicitous TX AG and gubernatorial candidate Abbott's response to being sued over the Texas Photo ID law, when he disingenuously claimed: "The U.S. Supreme Court has already ruled that voter ID laws do not suppress legal votes, but do help prevent illegal votes." "I have always thought that [Justice] David Souter [in his dissent] got the thing correct, but my own problem with the case was that I didn't think the record supported everything he said in his opinion," said Justice Stevens, who retired in 2010. "He got a lot of stuff off the Internet and inferred things and so forth." But "as a matter of actual history, he's dead right. The impact of the statute is much more serious" on poor, minority, disabled and elderly voters than evidence in the 2008 case demonstrated, he said. In his about-face on his own ruling, Posner, like Stevens, also cites an inadequate record of evidence of discrimination provided by attorneys in the initial case in Indiana. As Posner now says, "maybe we should have been more imaginative… we…. weren’t really given strong indications that requiring additional voter identification would actually disfranchise people entitled to vote. ... I think we did not have enough information." On the other hand, Posner recently told the New York Times' John Schwartz he was surprised at the reaction to his remarks, but that much had changed since his Crawford decision. "There's always been strong competition between the parties, but it hadn’t reached the peak of ferocity that it's since achieved," Posner told Schwartz. "One wasn't alert to this kind of trickery." As I noted in my first story on this, there was, by the time of the Crawford case at both the Appellate and Supreme Court levels, tons of information illustrating both the disparate effect these laws would have on certain classes of voters, as well as a mountain of evidence revealing that such laws were little more than a well-designed and well-funded Republican scheme to keep certain types of voters from voting. As I detailed in that piece, much of that evidence had been revealed by The BRAD BLOG itself over many years prior to Crawford. Perhaps that's even where SCOTUS dissenter Souter, who was "dead right", got some of the "stuff off the Internet", as mentioned by Stevens. Moreover, in response to our initial article citing Posner's admission, Bill Groth, who served as lead counsel for the Indiana Democratic Party in the Crawford case, took exception to the claim that there was a lack of evidence presented to the court to support the idea that voters would, in fact, be harmed by Indiana's then-new Photo ID restriction law. "It is untrue to state or imply that the record contained no evidence from or about voters who'd be disenfranchised or unnecessarily burdened by the law's requirements," Groth wrote in comments to The BRAD BLOG. 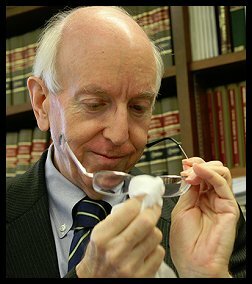 "The problem with Posner's ruling," he continued, "was not the lack of evidence but that, as he now concedes, he applied the wrong legal standards, including a too strict burden on the Plaintiffs and no burden whatsoever on the State to prove that the 'problem' the State sought to ameliorate (imposter voting) existed. He also made no effort to inquire whether the new law would unnecessarily burden or even disenfranchise more voters than the number of imposters it would deter or detect." "Not only did the record before the district court, which is accessible at no cost here, include a large number of affidavits from voters who did not have and would be unable to obtain a photo ID, it included expert testimony including from a renowned political scientist at Indiana University who opined, without contradiction, that this law would increase the costs associated with voting and thus have an adverse impact on turnout," wrote Groth. The record does seem to support Groth's claims about the case at the time. Even Posner now admits that point, in a fashion, by acknowledging that he believes the dissenting opinion by Judge Terence Evans (now deceased), was the "right" one. Let's not beat around the bush: The Indiana voter photo ID law is a not-too-thinly-veiled attempt to discourage election-day turnout by certain folks believed to skew Democratic. The fig leaf of respectability providing the motive behind this law is that it is necessary to prevent voter fraud--a person showing up at the polls pretending to be someone else. But where is the evidence of that kind of voter fraud in this record? Voting fraud is a crime (punishable by up to 3 years in prison and a fine of up to $10,000 in Indiana) and, at oral argument, the defenders of this law candidly acknowledged that no one--in the history of Indiana--had ever been charged with violating that law. ... [W]here is the justification for this law? Is it wise to use a sledgehammer to hit either a real or imaginary fly on a glass coffee table? I think not. So, even if a case could be made that more evidence of disenfranchisement might have been given to both the Appellate and Supreme Courts, the fact that the state was required to offer absolutely no evidence of actual fraud that the law was purportedly designed to prevent, remains the irrefutable Republican Elephant in the courtroom. Even now, as the non-partisan news consortium News21 recently pointed out, out of every known election fraud-related case in the U.S. between 2000 and 2001, there were no more than 10 cases total -- out of hundreds of millions of votes cast in all 50 states -- that might have been deterred by polling place Photo ID restriction laws. Just ten! "Judge Posner's admission of error is indeed a stunning one," Groth said in concluding his comments. "Had he switched his vote, the Indiana law would have been declared unconstitutional, and the odds that SCOTUS would have granted cert. would have declined exponentially, given Posner's prodigious reputation. In short, there would have been no Crawford decision handed down by SCOTUS in 2008 and many other voter suppression laws subsequently enacted would not have enjoyed the broad license many now (though wrongly) claim Crawford provides." Those points are all true. And Posner is now being called out on those facts. On the other hand, if you don't care for the facts, you can simply do what the shameless Rightwingers are now doing: attempt to destroy Posner's character itself, based on personal smears and entirely baseless lies. That's how they got this far with these kind of laws, so why not keep up the bad work? It's only the very heart of democracy they are hoping to keep trampling on.